Conservatives aren’t particularly known for their sense of humor, and Ajit Pai has proven in the past that he’s profoundly terrible at telling a joke. On Thursday, he told one bomb after another at a gathering in Washington, DC. 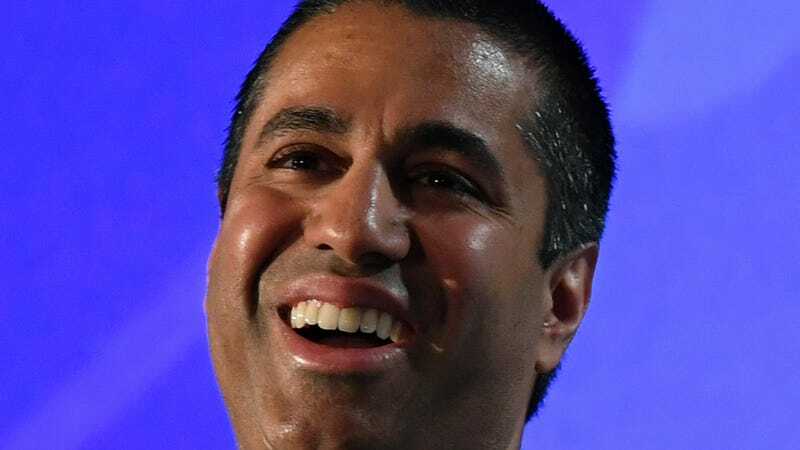 Comedy is timing, and Pai thought it was a great moment to get a laugh out of the fact that he’s dismantling the internet at the behest of telecoms. The FCC’s annual gathering of the Federal Communications Bar Association is kind of like the White House Correspondents Dinner. It’s an annual chuckle-fest in which professionals connected in various ways to the FCC and telecoms hang out and let their hair down (hence the nickname “telecom prom”). The FCC Chairman is expected to roast himself a little bit at these events. And Pai was more than happy to reference all of the big headlines of the last year, in which he’s ignored the desires of an overwhelming majority of the country by deciding to kill net neutrality rules, refusing to follow a legitimate process to hear the public’s comments, and essentially allowing telecoms to dictate policy. Despite the fact that his Chairmanship at the FCC is inherently a joke itself, he didn’t manage to land a single punchline. Cameras weren’t rolling at the event, but a tipster sent us a stealthy recording of Pai’s standup set. The quality of the video is mercifully poor, so you won’t have to watch Pai as he smirks his way through what sounds more like a confession than an exaggeration. “That sounds awesome,” Pai responds. We’d love to say it’s funny because it’s true. But for some reason, we’re having a hard time laughing. Update: A helpful reader pointed out that the “Verizon executive” in the video joking about installing a brainwashed “Verizon puppet” as FCC chair (screenshot below) is actually Kathy Grillo, Verizon senior vice president and deputy general counsel. At around 21:10 you can hear Pai say, “Hey ‘G’ what’s up?” while high-fiving Grillo. Correction: A previous version of this article stated that Ajit Pai joined the FCC in 2003. It was 2007. He was appointed a commissioner in 2012. We regret the error. Got a tip to share about the FCC? Email: dell@gizmodo.com.